If you’ve never been fly fishing at night it might seem like it would be much harder then fly fishing during the day. In fact the opposite is true, because you’re focused on a single target your casts tend to be more accurate and your focus is much better. There is nothing like seeing 20 or 30 Snook swimming in a tight circle and watch one turn and hit your fly. Our Fort Myers night fly fishing charters are for Snook and Tarpon, although you never know what that next cast may bring. There are always some bonus fish like speckled trout, ladyfish, and others. On an average night it’s not unusual to see well over 200 Snook and have a good chance at catching one over 30 inches. We fish areas that are close to artificial sources of light that attract the Snook. In addition we will also be fishing many of the residential canals where the owners have placed lights on the bottom to attract fish. Fly fishing is one of the best, if not the best way, to catch these fish. They can be very spooky around the lights and the stealthy presentation provided by fly fishing is perfect for getting these fish to bite. On the charter you will be fishing with a 9wt flyrod so it’s very important that you’re proficient casting at least 40 to 50 feet before you arrive for your charter. If you don’t have access to a nine weight flyrod let us know ahead of time and we can schedule some one-on-one instruction time before your charter. Casting at night is very different than casting during the day for most fly fisherman. Everyone is used to watching their fly line in order to judge distance. Obviously at night you can’t see your fly line so the best way to learn to accurately cast at night is to measure your cast off to the side of your intended target so that you can be confident that you have just the right amount of fly line to reach. Fly fishing at night requires precision casting skills and with a little practice you can get good at estimating how much line you need to reach a target. Remember you will have Capt. Eric by your side to help you with those first few casts until you get the feel for casting at night. Remember the most important thing you should do is to practice casting as much as possible with a 9wt fly rod. We are busy most of the year, so it is important that you book your fly fishing charter as far in advance as possible. If your plans didn’t allow you to book early, let us know and we will try to work with our other fly fishing clients to see if we can find a time and date that works for you. We provide you with high quality fly rods, reels, flies and leaders for our fly fishing clients. Included is ice cold bottled water, and a large cooler with ice for your personal beverages and snacks. We have a digital SLR camera to take high resolution photos of your catch. 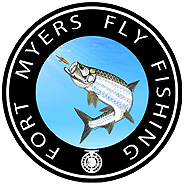 This is especially important on our Ft Myers night fly fishing charters. It is very difficult to take good night fishing photos. Sunscreen (no spray on sunscreen), Polarized Sunglasses, A hat or visor really helps with the glare. Food or snacks. There is room in the cooler for your food and soft drinks. We supply ice cold water so you don’t need to bring any. It is OK to bring beer and a light jacket is a good idea in the winter months just in case we have a cool day. PLEASE DON’T BRING ANY BANANAS! Why No Bananas? - CLICK HERE FOR THE ANSWER! The Brazilian wandering spider (Banana Spider) is the world’s most venomous spider and they often hide in bunches of bananas. Sailors on the fast schooners used in 1800’s often died suddenly, but only when transporting bananas. (So Bananas Must Be Bad Luck). I have had many charters where the fishing was awful and the client took a banana out of their carry on! The minute it was tossed overboard the fishing improved right away. This has happened many times over the years, one time could be coincidence, but multiple times means bananas ARE BAD LUCK SO – NO BANANAS on my boat!